I picked this book up for one reason and one reason only—because Sarah MacLean recommended it as one of her top historicals ever, like ever. Apparently, that's all it takes for me when it comes from the lady who gave us Callie and Ralston. And I have my suspicions that might be all it took for a few of you, too. We are in good company together then, yes? This was my first of Lisa Kleypas' historicals. Having read and been mildly okay with one of her contemporaries and read and absolutely loved one of her others, I figured the wind could reasonably be expected to blow any number of ways with The Devil in Winter. Some authors transition beautifully from one genre/time period to another. Others, I feel, face more of an uphill battle. Spoiler alert: Ms. Kleypas appears to know her way around whichever she feels like tackling at the time. I will say that I initially read a library copy and held off on purchasing my own because I was not fond of the U.S. cover. So much lavender. I can't . . . with just so much lavender. But then. The UK cover waltzed onto the scene. With Evie standing in the snow. Just . . . looking. It is everything the book deserves and it, of course, had to be mine. Evangeline Jenner has summoned what remains of her flagging courage and made a command decision. Said decision involves sneaking into the home of vaunted rake Sebastian St. Vincent and demanding he run off to Gretna Green with her to be married before her hideous relatives can stash her in a closet and force her to marry her cousin, thereby gaining control of her dying father's gambling money. (Did that last sentence put a silly grin on anyone else's face? Just me?) Having been beaten down and pushed aside her entire life, Evie just wants to be free. If a loveless marriage to a known dissolute is what it takes, she will gladly pay the price. St. Vincent will get the money he so desperately needs to pay his father's debts and the two can happily live the rest of their lives separately. After his initial amusement and disbelief at the shy wallflower's proposal, the wayward viscount finds himself accepting and the two of them go haring off for parts north as fast as possible before anyone can say them nay. Before either of them know it, the marriage has been solemnized and it's back to London and the grim reality of bidding farewell to Evie's father along with the unexpectedly complicated feelings they experience in the face of the prospect of going their separate ways. The Devil in Winter has one hell of a beginning and that's all there is to it. Talk about hook, line, and sinker. I fell in love with Evie almost with her first exhalation. What a sad and dim life she led leading up to the moment she felt forced to go to St. Vincent with an offer she wouldn't let him refuse. And how I liked her for the way she faced him down and stutteringly told him the way things were going down. As for Sebastian, I grew to like him quickly for how quickly he grew to like Evie. For his wicked wit and hilariously cavalier attitude toward life and the ton. And for the appalled look on his face when he realizes he might . . . he just might be falling in love with his wife. It was a pleasure watching Evie's shoulders slowly relax while in Sebastian's company, just as it was a treat watching that very attitude of his grow less and less cavalier when it came to his wife and the altered way he saw the world as a husband. So very much against his will. But there it is. The story did bobble just a bit for me back in London as the two take up residence in Jenner's gambling hell and I felt things veering a touch close to the shallow. But the ship rights itself soon enough as they stumble up against each other's expectations and the scars (in Evie's case) and indiscretions (in Sebastian's) of their respective pasts. This was helped along by Kleypas' uncanny knack for suddenly and unceremoniously shoving the two of them in a hallway or billiard hall or sick room at just the right moment so they could sort themselves out. I'm ever so fond of them, Evie and Sebastian. I will always be glad they came to stay. Alexa Loves Books - "It was brilliant." Another Look Book Reviews - "Evie was the best thing to happen to Sebastian and visa-versa. They were perfect for each other's souls." Dear Author - "This was the most fun I’ve had reading one of your books in years." Gossamer Obsessions - "For the most part, the novel is wonderful." Impressions of a Reader - "In St. Vincent, Kleypas gives us a hero who in the end not only finds love and redemption, in the process he also finds who and what he was meant to be all along." Read React Review - "Almost immediately, Sebastian and Evie establish a repartee that is a delight to read. It's like worlds away, right? 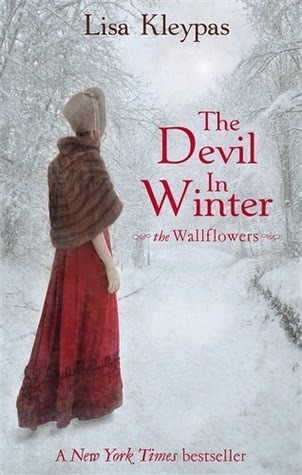 I enjoyed this one, too, although the first book in the Wallflower series is simply brilliant. They are all good, aren't they? I like each of the girls. But Evie somehow remains my favorite. Just in case you ever feel your reviews aren't working (which you probably don't)--I just wanted to let you know that I immediately went and checked this one out from the library after reading your review. YOU HAVE A WAY WITH WORDS. I'm really enjoying it so far (they are just returning to London now), but I must admit that I'm still feeling pretty apprehensive of Sebastian at this point--although I am prepared to warm to him. I wish I'd come across it earlier in my historical explorations! I've heard he's pretty bad in that one. It was clear what he'd done in this one. Yikes. But yes. I love him so. Hooray!! I'm so tickled to hear that, Lizzy. Have you checked out Smooth-Talking Stranger (sequel to blue-eyed devil)? It was another good one, and I recommend checking that one out, since you loved Blue-eyed Devil (and this is coming from someone who also had a lukewarm response toward Sugar Daddy). Oh, so glad it was fun. Lol. That is a funny scene. I softened toward him when he clearly was afraid she would contract TB from her dad. Then fully won over when Cam notes how he'd never seen anyone look with such longing as Sebastian did at his wife. Yeah . . . I loved that moment with Cam observing them as well (he saw through everything, that Cam), but alas, Sebastian chaffed against my feminist sensibilities for the longest time! I guess that is my only issue with the romance genre--Are those books feminist or anit-feministic? It's something I think about a lot when I read them, and it was always on my mind when reading Sebastian. Agen Bola Terpercaya indo11.com melaporkan, Manajer Southampton, Ronald Koeman mengaku bahwa ia amat menghormati manajer Arsenal, Arsene Wenger, namun percaya bahwa kubu The Gunners tidak terlalu bersinar musim ini. Kedua tim akan saling adu kemampuan di Emirates. Tim asuhan Koeman ada di peringkat tiga klasemen sementara, unggul enam poin dari kubu London. "Saya amat menghormati Wenger. Saya kagum padanya karena ia sudah lama menjadi manajer dan ada di Arsenal. Ia melakukan pekerjaan yang fantastis, namun tim seperti Arsenal harusnya berjuang merebut gelar juara, dan selalu ada kritik ketika hal tersebut tak terjadi," tutur Koeman. "Ia amat berpengalaman di bidang manajemen daripada saya dan ia akan mengatasi semua situasi yang ada tanpa masalah," pungkasnya. Oh, I think I must reread this. Like, immediately. By the way, I'm also rather fond of Mine Till Midnight, which pairs Cam with someone not seen in the Wallflowers series.